Passengers at Stansted Airport who had done all they could to prepare for journeys abroad, including taking out travel insurance, have spoken of their frustration at the winter weather affecting their plans. 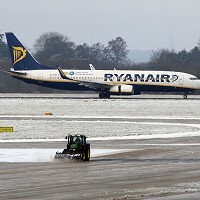 The runway at the airport in Essex was closed for two hours following heavy snowfall on December 5 just as the first flights were set to leave. As a result of the delays and cancellations, long queues of passengers formed, all hoping to arrange alternative travel plans - including Steven Ingram and Stephen Allen, from Watford, who had been due to fly to Spain to watch the Barcelona take on Benfica in the Champions League. Mr Ingham, 56, said the passengers on his flight were on board the plane but were then told to disembark and go through passport control again. Head of communications for Stansted, Mark Davison, said 23 outgoing flights and 20 incoming flights had to be cancelled - most of which were operated by Ryanair. He said the combination of snow settling on the icy runway had created hazardous conditions. But he added airport officials were satisfied with their efforts to clear 500,000 square metres of snow and ice in just two hours to allow planes to operate out of the airport again.